My apprentice who recently finished a 6 month intensive program to get a job in the field came up with a new way of clamp pressing veneers together. I provided instructions to sand down veneers to consistent thickness and to use platons to ensure equal pressure and no gaps. I would appreciate any feedback on why clamping directly with the veneers is not the right method. Don’t see what is ‘new’ using clamps and battens. I think you need a thicker platen, to get more even pressure as you have very little pressure between the 2×4’s So I would expect a wavy surface as shown. If you have thick sawn veneers that need flattening the tool you need is a toothing plane. I’m afraid I don’t understand your question about the clamping. 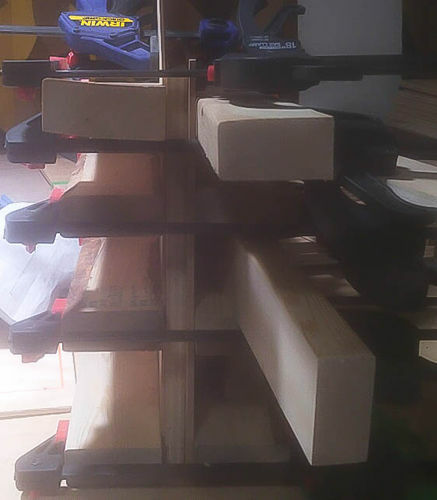 My apprentice clamped cauls directly to the veneers – alternating 2×4’s – the areas that were not pressed with a caul did not have enough pressure creating gaps. I am attempting to get across to him that best practices are important – they have been tested extensively by experienced woodworkers. OK got it. A press is best but clamps with cauls work too. If you use a platons on both sides with cauls – attaching alternating cauls directly to the veneers appears to create uneven pressure. Can a low angle jack plane not create an even thickness for a 1/8 in veneer which is 14×16 in ? This isn’t easy to see but I think what you are referring to as cauls are only about 1/4” thick. That would be your problem. The cauls should be at least 3/4” thick. I use double 3/4” MDF in my press. Are you asking about evening the surface of sawn veneer before pressing to the substrate? Traditionally that has been the job of the toothing plane. If you are referring to fixing your wavy glue up I would doubt it can be saved unless you were using hide glue. If you were, strip the veneer and re-glue it with proper cauls.